These three important tips will point you in the right direction to create a winning kitchen backsplash. Decide on the countertop you want first. Then you can start talking tile and backsplash designs. Make sure the two complement each other. Don't draw attention away from a stunning counter with a busy tiled background. If the countertop is plain or simple, then let the backsplash be the focal point. Here's a few photos that show the "yen and yang" relationship of a counter and backsplash. A bright bold backsplash using Barcelona San Jose 6" x 6" pairs nicely with a simple solid-color counter. The Indian Teal brown granite countertop takes center stage. The decorative dots and field tile are the supporting cast. Decorative Spanish Teruel Dots sparingly accent the Yucatan Chamois 4" x 4"
Work with the available space. You can't fit 10 pounds of gold into a 5 pound sack. Large tiles with big patterns just don't work in that tiny wall-space behind the sink with that big picture window - no matter how much you love that tile. It sounds obvious; but pictures make it very clear. Define your style. A kitchen designer can really help. First, though, try to define the experience you want to achieve, the importance of aesthetics versus 'ease of maintenance'. Do you like clean lines and contemporary designs or classic patterns? Bright colors or muted colors? Vivid colors or earth tones? Finally, answer questions similar to those we posed on how to Discover your Dream Bath (hint: substitute 'kitchen' for 'bath'). Here's a few more kitchen backsplash designs. Which is your favorite? "Stuck in the 60's"? I don't think so. The abundance of exciting new products for the bath environment available today allow for a bathroom that can be inspirational as well as functional. You may remember, I'm not a morning person. I've already described how my bathroom, in a previous post, jump-starts my day and and inspires me to face the new day with energy and eagerness. Stuck in the 60's? Not in this Bathroom! Not everybody is as groggy as I am in the morning. Not everybody wants or needs as much stimulation as I do to get going each day. The Morning Person jumps out of bed already fully awake and ready to start their day. Annoying as that is to grumpy risers like me, shouldn't the Morning Person also be revitalized and have an attitude shift as they stride into their bathroom? Actually they do not need an attitude shift, they want an attitude confirmation. I'm OK, you're OK, the world's OK and my bathroom is wonderful! The MP is revitalized by the serenity and comfort of their bath space. Soothing, reaffirming and beautifully harmonious. No jarring contrasts for them. Soft or neutral colors for the tile or stone surfaces create a tranquil background that sets the mood for a pleasant start to the day. While I want shine and refection, the MP finds a matte or satiny surface more agreeable. Bath fittings and fixtures blend in with the tiled surfaces for a unified design theme. Everything in its place. While I say, "Hello new day, I'm ready", the Morning Person says, "Hello new day, all's well with the world". And we both love our bathrooms. Walls surfaced in tile, glass or stone in neutral or soft colors that become a soothing background. Floors tiled to blend in with the walls. Stone mosaics are nice in a honed finish. Little or no contrasts in color and surface texture. Surfaces are non-reflective. Soft lighting combined with appropriate task lighting. A tub for relaxing (tubs are not for me, they make me fall asleep…) and fittings that blend with surfaces. A place for their candle collection. Sunny McLean has been in the tile and bath industry for over 30 years. She is the author of The Basics, a workbook for the service-oriented tile and bath showroom and has recently designed a tile line for McIntyre Tile called Streamline. To find out more about Sunny, visit her website at SunnyMcLean.com. 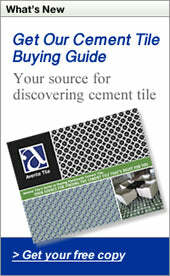 You may purchase The Basics at TileHeritage.org. Images used in this post are the property of houzz.com. Browse over 60,000 home design photos and save the photos you like to your own ideabook at houzz.com using the image search feature below or on their site. Recently, I showed how to Create a Cement Tile Floor Plan with Large Patterns & No Border. Today's variation on that theme will show how to create a tile floor plan or layout for common (four-tile patterns) that use a border or double border. This can be more difficult. You want to make sure the field (patterned) tiles have symmetry within the border, the 'rug' or field and border tiles are centered in the room, and you need to avoid cuts to border to maintain the design. No matter how simple the project may seem, I recommended that you (or your designer) show the tile pattern layout for a room. You'll then know how many tiles to order and it's the best way to show the installer exactly how you want the floor to look. To create a tile floor plan you should follow these steps to achieve the best results. Make sure to use a scaled drawing and include an allowance for the grout joints (usually 1/16"). In this example, we chose the Cuban Heritage Design CH220-3B. We want to create a traditional rug pattern in the center of the room with the border forming the outer edges. This tile comes in an 8"x8" format and will use the distinctive double border. A double border is simply a border that requires two rows of patterned tiles instead of one. To avoid cuts to the pattern, the edges outside the border are filled with a solid color tile, Heritage Turquoise, that will be used around the room's edge. Here's the steps to create a flooring plan that includes a double border and is based on using a pattern that requires four (4) tiles to make the design (CH220-3B). Find the center of the room. Do this either with a chalk line for smaller rooms or more precisely by measuring each side of a rectangular room. When finding the center or a room, ignore closets, niches or alcoves connected to the main part of the room. Place the center of the pattern in the center of the room. Notice the cement tile pattern we're using only requires four (4) tiles to complete the pattern; so, four (4) tiles are placed in the room's center. Continue the pattern in all directions until their isn't enough room to complete the pattern and border without cutting a tile. Remember, the outer 2 rows of tiles will form the double border. Fill the remaining, irregular space around the edge of the patterned field tile with a complimentary solid color cement tile or stone. Connecting closets or small rooms should use the same flooring material as the edges. Voilà! The cement tile layout or plan is complete. Creating symmetry with the pattern inside the borders isn't always as easy as it looks, especially with rectangular rooms. Have patience as you may need a few iterations to get it just right. You'll be glad you discovered any problems on paper rather than during installation.